"Poor Nellie, in fact, saw little of her publicity-hungry parents, who preferred red carpets, cheering throngs and state banquets. As one of Grant's biog­raphers has put it, 'much has been said about how Grant, the simple fellow, manfully endured adulation because it was his duty to do so. This is nonsense.' Folks back home were thrilled by New York Herald journalist John Russell Young's accounts of the 'stupendous dinners, with food and wine in enormous quantity and richness, followed by brandy which the general countered with countless cigars.' Even more than her husband, Mrs. Grant -- but for Fort Sumter, a drunken tanner's wife in Galena, Illi­nois -- 'could not get too many princely attentions.' As a result, 'the trip went on and on and on' -- as did Young's columns in the Herald. "Wherever they supped, the Grants left a legendary trail of gaucheries. In Venice, the General told the descendants of the Doges that 'it would be a fine city if they drained it,' while at a banquet in Buckingham Palace, when the visibly uncomfortable Queen Victoria (horrified at a 'tantrum' by son Jesse) invoked her 'fatiguing duties' as an excuse to escape the Grants, Julia responded: 'Yes, I can imagine them: I too have been the wife of a great ruler.' In Berlin, the Grants hovered around the fringes of the great Congress of Powers as it grappled with the 'Eastern Question' as a prelude to the final European assault on the uncolonized peoples of Africa, Asia and Oceania. 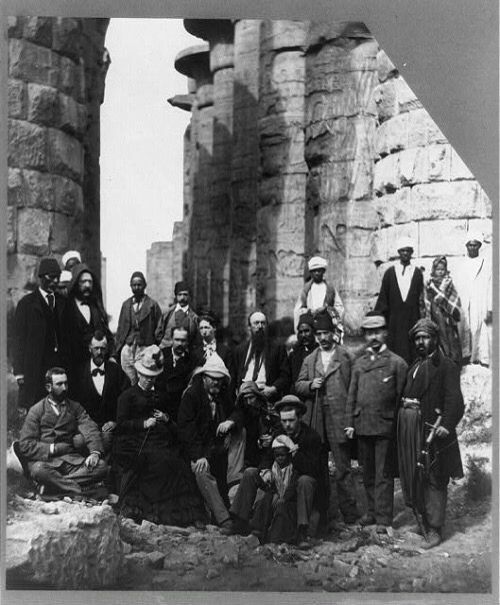 "Perhaps it was the intoxication of so much imperialist hyperbole or the vision of even more magnificent receptions in oriental palaces that prompted the Grants to transform their vacation into a world tour. With James Gordon Bennett Jr. of the New York Herald paying the bar tab and the US Navy providing much of the transporta­tion, the ex-First Family plotted an itinerary that would have humbled Alexander the Great: up the Nile to Thebes in Upper Egypt, back to Pal­estine, then on to Italy and Spain, back to the Suez Canal, outward to Aden, India, Burma, Vietnam, China and Japan, and, finally, across the Pacific to California." For any learned reader who has read military historian John Keegan's "The Mask of Command" chapters on Grant, or the Great General's own autobio, this little excerpt says nothing other than that fake news was alive and roarin' in the guise of New York Herald journalist John Russell Young. This only makes sense, a per issue profit tiger does not change it's "man bites dog" stripes. That is, we can know that Grant was an honest and honorable person who spent his last year dying of cancer writing the autobiography that now stands as one of the best because he was NOT corrupt and never cashed in on his fame in his lifetime. We also know very well today that the press are liars who are paid by the word and so can take the disparagement trumped (intentional) up here with a grain of salt. The bookseller rehashing yellow journalism. The pity is that Mike Davis seems to have missed all this.